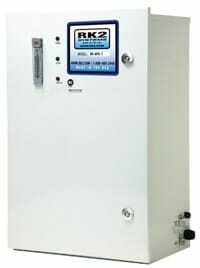 RK2 systems Ozone Generators employ the latest in ozone production technology. With standard models up to 45gm’s/hr and larger units available on request, RK2 and Pure Aquatics have an ozone generator to suit your application. Featuring Advanced Plasma Gap technology, all APG systems are compatible with any operating voltage and do not require desiccant air dryers to properly function. Our APG Series ozone generators offer improved water quality and clarity while reducing the amount of chlorine and chemicals used within your display. Units oxidize up to 99.99% of harmful microorganisms, while eliminating oils, lotions and other contaminants from your water. Each APG System is designed to offer customers a high output / low energy cost solution with a simple and inexpensive cost of ownership. Use of our systems will further aid in the reduction of wear and tear on additional life support equipment used within your life support system. .05 Amps @ 240 VAC 50 Hz. .1 Amps @ 240 VAC 50 Hz. .15 Amps @ 240 VAC 50 Hz. 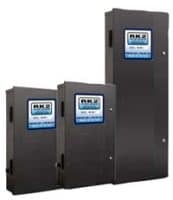 RK2 Systems models RK-2G through RK-45G produce ozone at 2, 5, 7, 15, 25, 45grams/hour at 3-5% by weight. All systems operate under vacuum, for safety, efficiency and ease of operation. Each model has configurable feed-gas options (integrated oxygen concentrator system is standard), multiple safety features, self-diagnostic switching and robust construction. Variable ozone output control is available on models RK5G through RK-45G. Ozone is the most powerful oxidizer and disinfectant that can safely be used in multiple industrial and commercial applications. It destroys all organic molecules, renders dissolved metals insoluble and oxidizes inorganic contaminants. With a relative sanitizing strength of 1 PPM aqueous ozone to 200 PPM chlorine, ozone is safe for all surfaces (excluding natural latex rubber). Ozone is an EPA approved antimicrobial and listed as safe for discharge into surface and groundwater; FDA approved as an antimicrobial food additive, and USDA approved as an antimicrobial organic food additive. Leaving no measurable residual (no rinse), RK2 Systems Corona Discharge series provide a non-corrosive solution for continuous or on-demand sanitation. Each of our units are built to UL standards, are NSF validated for antimicrobial efficacy and safety and are designed as totally integrated systems providing a synergistic approach to water or surface sanitation in multiple commercial and industrial applications while giving facility operators a simple, automated, low maintenance system. @ 240 VAC 50 Hz.